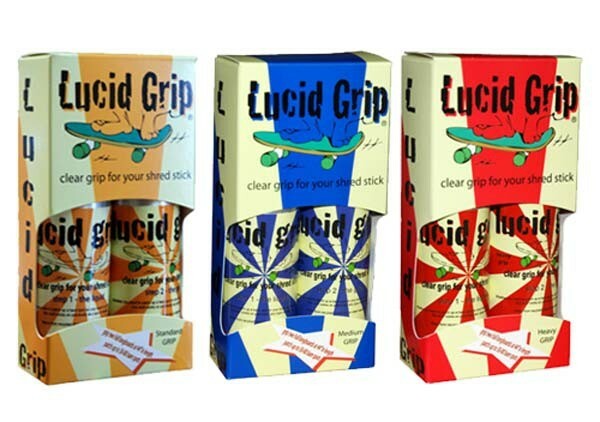 Lucid Grip is an extremely transparent gripping product designed for application on skateboard decks as well as on many other materials that need a form of non-slip surface. This two-part process is very easy to use and can be applied to many surfaces including wood, concrete, plastics, and most metals. Once applied and proper dry time has passed, this grip will last as long if not longer than most other producst used for abrasively gripped surfaces. So, wether you need to patch up a few bare spots or grip a whole new deck, Lucid works well on all styles of skateboards including pre-gripped surfaces. Dry time is approximately 40 minutes with ideal conditions of 15-38 degrees Celcius in well ventilated areas. Good for about 3 boards.